Auction Closed. Sold via Buy Now $800. Next auction Monday November 6. 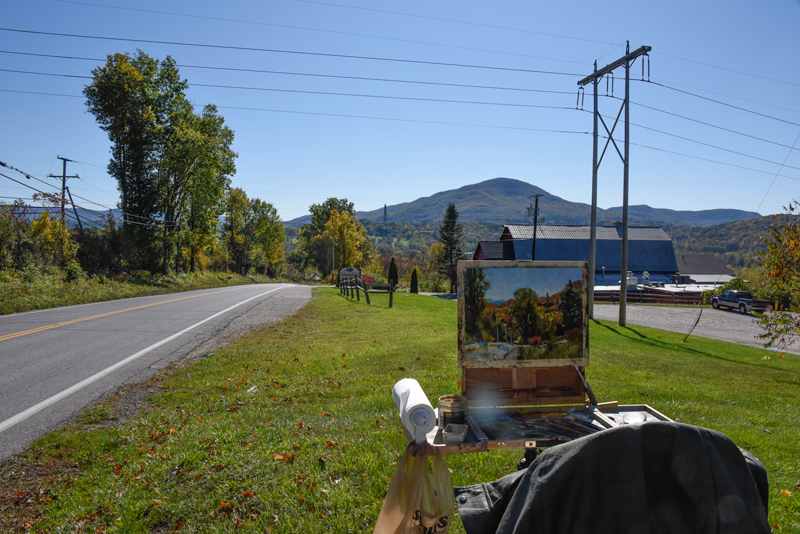 I followed the color south last week to Bennington, Vermont. But that wasn’t the only thing I found. As I sat there panting along old Rt 7A, soaking in the October sun, a profound sense of gratitude washed over me. Gratitude for beauty, life, and art. And the joy of sharing it with you. This is such a beautiful painting! 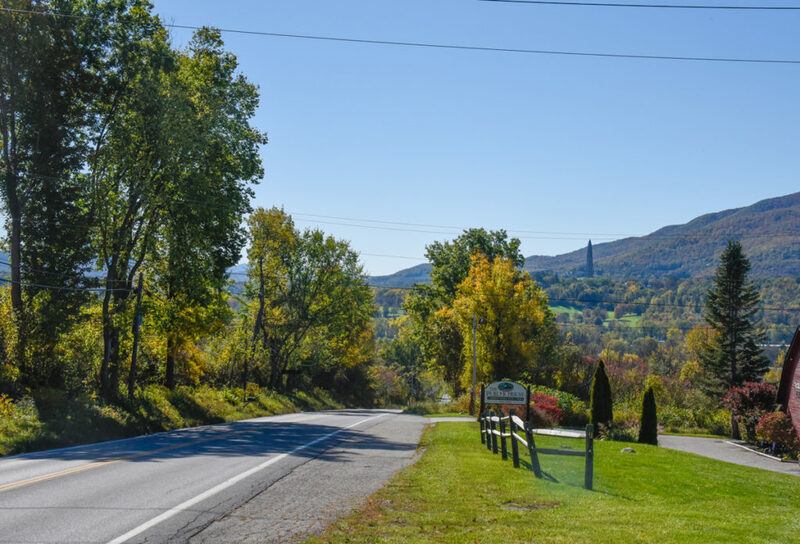 I grew up in Bennington and I love the scenery along Route 7a. I feel that you have captured it beautifully! Thank you. I travel to Vermont from Southern Jersey and come in on Route 9 from NY. The Bennington Monument assures me that I am back in Vermont. That is always comforting and thanks for the giving me that same sensation thru your beautiful art work! My cousin and I agree. 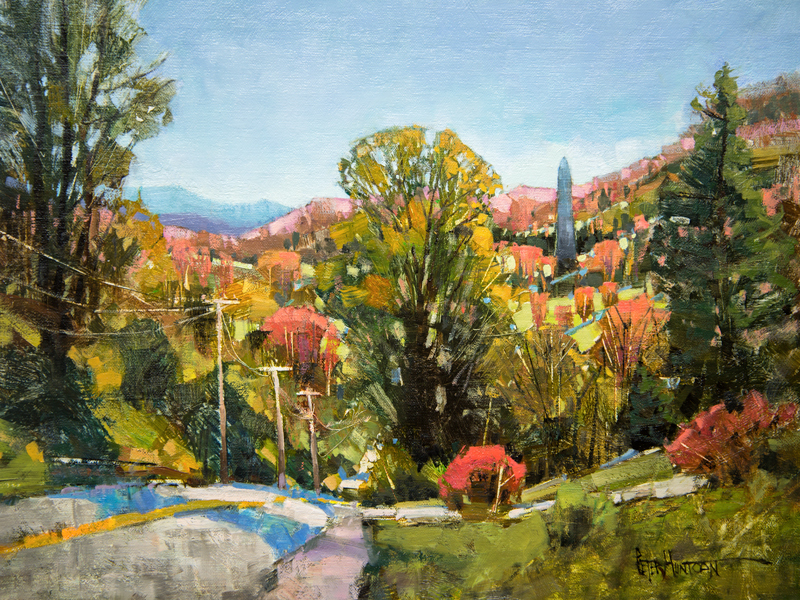 This reminds us of the view from our grandparents’ former home on College Road. Lovely! nice vibrant colors esp. sky! Love the way you filter out the unimportant parts of the scene, making it even better, without changing the truth. I found your introductory words for this painting as moving as the painting itself. Both in word and in paint I can really feel your sense of awe and inspiration while recording this beautiful scene. Thank you for sharing with us a glimpse of the soul of an artist. I always look forward to Mondays because I know I’ll get a lovely painting and your introductory words from you via e-mail. 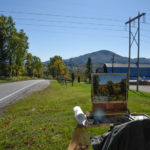 I visited VT (Pittsfield area) for many years and your paintings bring back very happy memories I’m 86 so don’t travel much any more but you take me to VT every Monday. Thank you for your meaningful paintings and words.